ICD DDL is situated on the main line on JAMMU-AMRITSAR-DELHI and only next to Ludhiana on Ludhiana-Ambala section. ICD-DDL is contiguously situated with the DDL railway yard. Ludhiana has its name in Punjab and whole of India due to large number of cottage and small scale wollen industries for hosiery and is also rightly called as the Manchester of India. This city is ideally located in the middle of the state and conveniently approachable from the industries spread all over Punjab, hence rightly called the Industrial capital of the State, therefore the best choice for the ICD to act as Hub centre. This ICD caters to the other neighbouring states of Himachal Pradesh, J&K, Haryana and Rajasthan. ICD has a modern infrastructure, 90% of the area is paved with concrete block flooring using latest technology. There are modern warehouses both for import and export handling of cargo with an area of 5000 sq. Mtrs.. We have the facility of customs clearance of export & import cargo and storage of customs cleared cargo, consolidation of LCL cargo, office of the Asst. Commissioner of Customs having his team of officers who takes care of all customs clearance. There are more than 6000 exporters and as many as 5000 importers using CONCOR facility in a big way. Our CFS is being notified by Customs for clearance of Air Cargo. Air cargo traffic from our CFS to Airport at Amritsar and New Delhi will be commenced. 5 reach stackers for handling loaded containers. 2 tractor cranes for handling of empty containers. 5 forklifts & 3 hydra cranes for stuffing & destuffing of cargo. 14 trailers for shifting of import and export containers within the ICD premises. Two full rake length railway sidings for handling of EXIM rakes. Daily high speed rake movement seperately for JNPT, NSICT, MDPT & PPBR Ports with 15 rakes in our close circuit. Crane handling facilities for unloading and loading of import and export containers and for stacking with state-of-art technology two Rubber Tyre Gantry Cranes (RTGs), four loaded reach stackers , one empty reach tackers, two loaded sling cranes, six tractor cranes, five forklifts and fifteen trailers for shifting of containers within the ICD premises. Examination facility of high speed rakes inside the ICD sidings. Stacking capacity of ICD is more than 4000 import, export & empty containers in an area of 35.07 acres of land. Spacious warehouse in an area of 3000 sq. Mtrs and with 86 ground slots for storage of import and export cargo with forklift facilities for unloading and loading of cargo from trucks and for stuffing and destuffing. Separate warehouse measuring 2000 sq. mtrs for LCL consolidation. Facility for direct stuffing & destuffing. 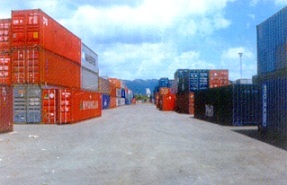 Facility for factory stuffing & destuffing of containers including multimodal transportation. Warehouse has eight gates for unloading and loading of cargo and facility for simultaneous stuffing of 60 containers at one point of time. Examination facility by Customs as A.C.Customs alongwith his team is housed at our CFS itself, who takes care of examination and supervision. Sufficient circulating area for truck movement while destuffing the import HMS cargo. There are two gates at ICD which takes care of smooth and flexible movement of trucks and trailers to avoid congestion even outside the ICD. Infrastructure for EDI is being constructed at the ground floor of Customs building which will also have service centre room for Customs. Fully computerised environment of working with all EXIM procedures being complied through system. We have given a liberal cheque/ PDA facility to the trade. A facility of 60 ton capacity weighbridge for weighment of containers within ICD has been commissioned in April 2002. 12 rooms for offices of Shipping lines, CHAs, freight forwarders, LCL consolidators is already in place besides the administrative building. We are also providing the specialised facility of container repairs as per ICL standards. 160 KVA backup generator for providing uninterrupted power supply for ICD. All the ICDs throughout the country are linked with V-SAT communication system for efficient interface and data transfer.